The Vintage Channel Strip consists of three plug-ins, reproducing the sound characteristics of classic 1970’s EQ and compressor devices. The Vintage Open Deck is a four-in-one tape saturation plug-in, that brings back the rich sound of legendary open-reel tape recorders. The Vintage Stomp Pack includes five ultra-realistic emulations of sought-after vintage guitar effects. multi effects and DSP processing. 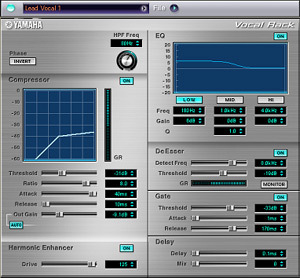 Yamaha developed the worlds first rack mounted multi effects processor, and have a long history in providing professional audio solutions to almost every top recording studio around the world.